We've not seen much of Square-Enix's Play Arts Kai Variant takes on the Star Wars universe, but what we have seen so far has been pretty damn awesome. But now the line is getting even better though,with the addition of these tricked out versions of Boba Fett and the Stormtrooper! 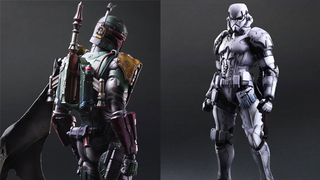 Square-Enix revealed the next two figures in their Variants Star Wars line earlier today. Like Darth Vader before them, don't opt for the necessarily wacky approach to radical redesign that we've seen from the Variant Batman toys, but a more 'realistic' (in so much as you can be with the sci-fantasy world of Star Wars. update to the iconic designs, giving them a more textured, panelled look and slightly bulking up the armour worn. They're not too out there, still recognisable as the originals, but different enough that they make for great looking figures. Boba actually comes with a plethora of extra accessories — FX pieces to recreate his jetpack firing and his wrist-mounted flamethrower, and a variety of hands to hold his blaster, a pistol, or one of two knives. There's also the prerequisite stand so you can pose the hapless bounty hunter careening into the side of the nearest sail barge if you so wish. Boba looks great but oh man, the Stormtrooper. I have a slight (read: very) Stormtrooper bias when it comes to Star Wars, but good lord this a lovely figure. I love the angular nature of it compared to the smooth edges of the classic armour, and the fact that it actually look like a combat suit too. These guys aren't repeated washouts from the Imperial School of Marksmanship that couldn't hit a thing if they tried, they are shock troops. There's something almost Mass Effect-ish about it, in a roundabout way. Like Boba, the Stormtrooper comes with a variety of hands with which to hold either his blaster rifle or the larger blaster cannon. There's also a delightful FX piece to recreate either blaster firing, perfect for all those "pew pew pew" poses. Ugh, fine Square-Enix I'll take like, 10 of them. Thanks to the Star Wars draw, these two figures will be a little more expensive than your usual Play Arts Kai — they'll set you back 12,000 yen apiece, or around $100. Okay then, maybe only one for me. Boba Fett and the Stormtrooper will be out in July.